Horticulture can be hazardous, and working around transmission lines increases the danger. Electricity can arc through the air even without direct contact. High voltage electricity flowing into trees can also cause them to ignite. Trees and shrubs should be kept clear of lines at all times – and people shouldn’t get too close either. Treat every power line as live at all times. Locate all the lines that pass over your property. Find out what voltage they are. Never touch or trim a tree you think may be closer than the minimum safe distance to a power line. 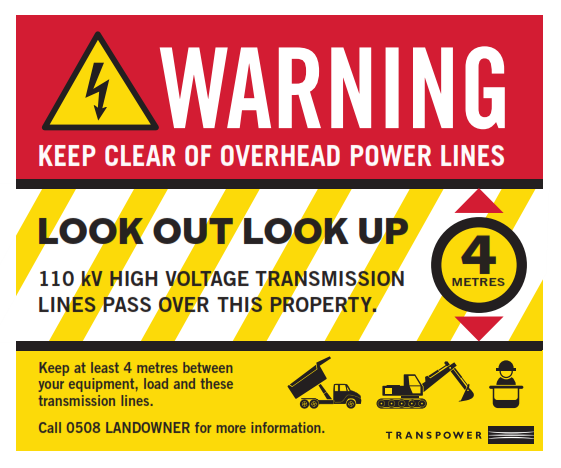 If you are unsure, or unable to determine the voltage of lines near you, ensure you are never closer than 4 metres to any lines. Any part of any mobile plant or load carried must be at least 4 metres away from 110 kV lines, and 6 metres away from 220 kV lines. If the mobile plant contains a person (e.g. a cherrypicker), the required minimum safe distance for all lines is 6 metres. If you don’t know the voltage of the lines, stay 6m away. It’s important that you make your workers aware of the dangers posed by working around transmission lines. We’ve produced a guide for you to help educate seasonal pickers. We have warning signs available to you, as well as warning stickers for mobile plant. Education is critical to keeping people safe around our lines – we encourage you to use the signs on fences and gates where mobile plant may pass. Contact us and we’ll get some to you. Electrical Safe Distances are set out in New Zealand Electrical Code of Practice 34 (NZECP 34:2001).